One of the most instantly recognizable animals in Africa is the warthog! Hunting warthog in Africa can be a rewarding adventure on its own merit. Fun, low-pressure hunting for this animal makes it perfect for a low-key day. Because of this, some folks will choose a safari with Warthog as the primary animal selection. They’re especially fun to just observe with their interesting characteristics of substantial tusks, antenna-like straight-up tails, and prominent warts (of course). However, “wartie” is most commonly a welcomed add-on to a plains game or dangerous game hunt. 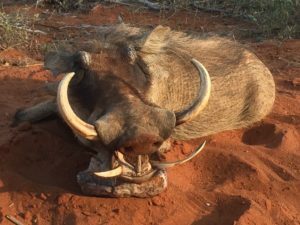 After the more sought after trophies taken care of, hunting warthogs is typically done as an opportunity or as a way of spending additional enjoyable time in the countryside – sometimes combined with pest control or varmint hunting. Check out our article “Hunting Varmints in South Africa – Cost Effective and Conservation Affective”). They are not normally difficult to hunt, but can be a challenge depending on habitat, or if they are grumpy from being pressured by predators. Warthog almost always give noteworthy experiences; you never know if you’ll be presented with a sounder (family of warthogs) that can be quite large and fun to watch, or tussling with an ornery lone male. While warthogs have a wide home-range and can be found in almost every area in southern Africa. The largest specimens I have seen have been in Namibia and the northern provinces in South Africa. In any region, the males are usually bigger bodied and have two wart protrusions per side on the head vs the females which have just one. Typically, males also have thicker tusks. If you’re looking for a unique trophy in addition to a relaxing hunting experience, warthog is notable trophy for any trophy room. You’ll be surprised at the number of guests that will gravitate to it, as it is obviously a very recognizable animal. It always gets attention in our house! Check out our hunting packages, or contact us now for more information on hunting warthog in Africa!